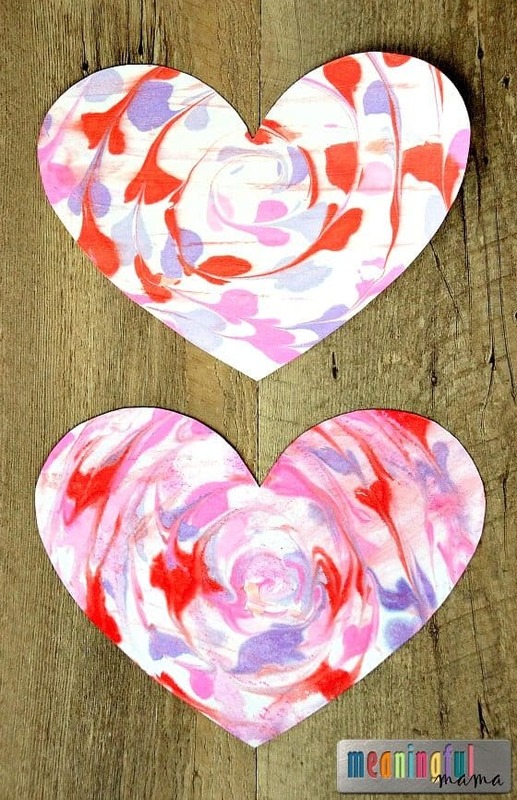 Knowing how much fun my kids had doing our DIY marbled paper from shaving cream, I knew a Valentine version would go over well. This marbled Valentine heart with shaving cream was the result. Just like the original version, my kids loved creating these. I know my audience has loved the concept too because this video has been viewed over 6 million times. I hope you enjoy the Valentine’s Day version just as much. Note: This was originally written in 2013, but it has been updated with a video and better pictures in order to provide quality posts for my readers. * Affiliate links provided for your convenience. Anything you purchase through these links helps to support Meaningful Mama and the free resources I provide. Thank you for choosing to support us. 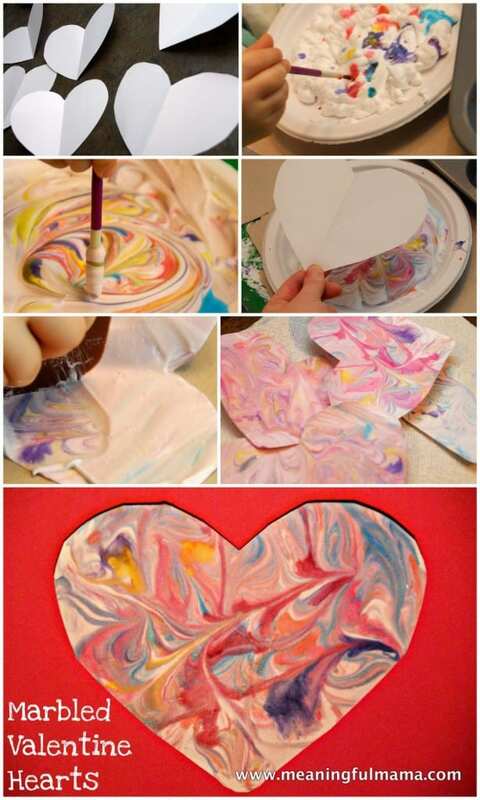 This Valentine’s day craft involves mixing color with shaving cream and dripping and swirling. Sounds fun, doesn’t it? It’s not hard to create this beautiful marbled look. My 2 year old son created the heart you see in the picture below with just a little tutorial and help from me. You will want to prepare a little bit before your kids get to the table. Once I was all set up, my kids were invited to the table. I did this craft with one child at a time. 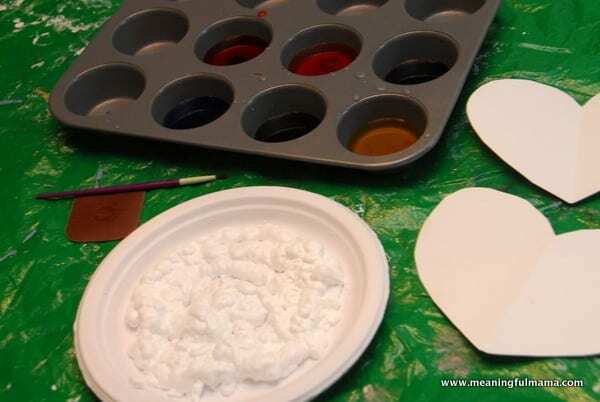 Prepare the muffin tin with different colors that represent Valentine’s Day. Use water to thin it out and make the color the saturation of your liking. 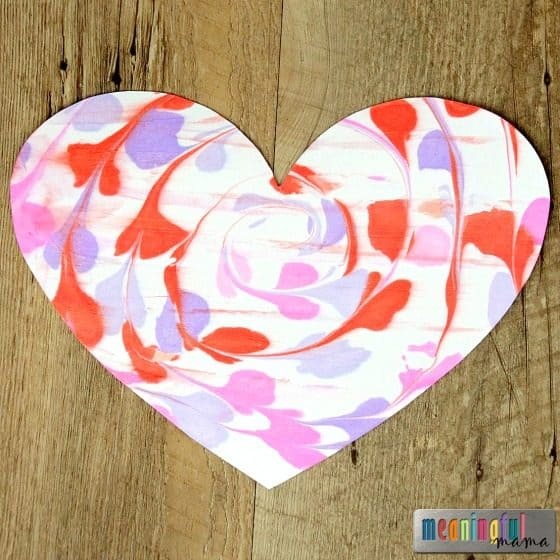 Print out your heart printable and cut it into the heart shape. Smaller kids may need help with this. You might want to prepare a bunch of these ahead of time if doing it with a large class of younger children. 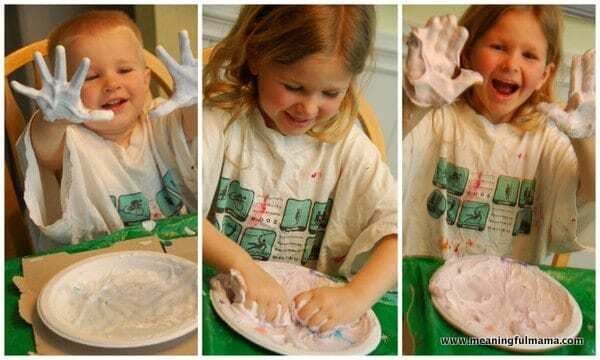 Squirt out your shaving cream onto a paper plate or jelly roll pan. Mine was was about an inch-ish thick. Spread shaving cream evenly across surface. 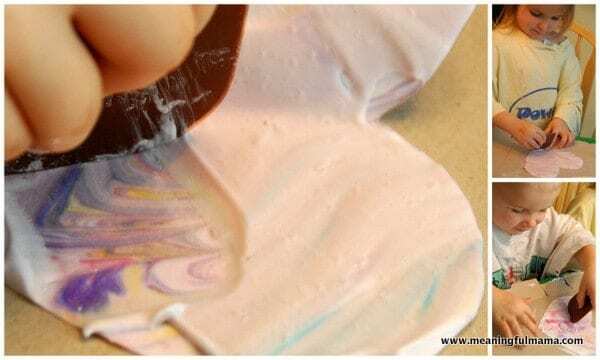 Next, take the watered down paint or food coloring and drip it randomly onto the shaving cream, using an eye dropper. 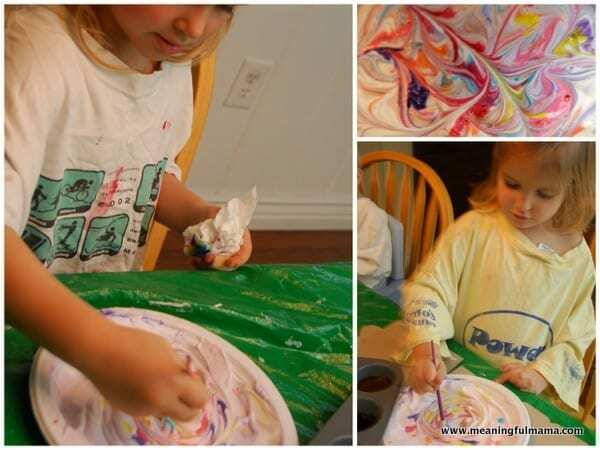 Using the back end of a paintbrush or a chopstick, swirl the color. Do not over-swirl or the marbled pattern will become more jumbled. To create hearts within the heart pattern, pull the chopstick straight through one of the drops. We swirled in a circle trying to get hearts through a number of our drops in the top featured picture. That creates a really cool Valentine effect. Next, lay your paper on top of the shaving cream and press down lightly. 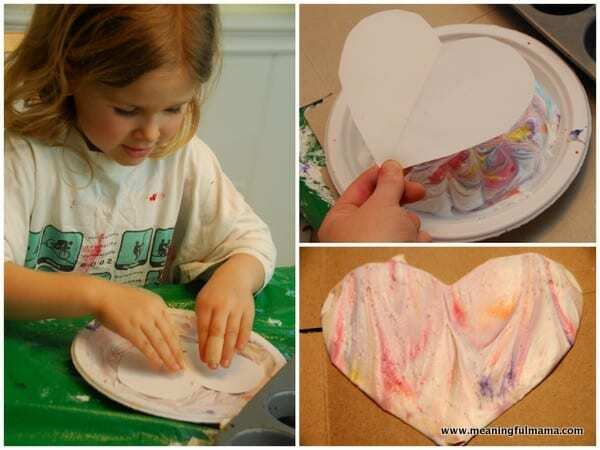 Pull the paper away and lay it on a paper towel, shaving cream side up. Right now it looks like a blog of shaving cream. Don’t worry! The magic is about to happen. Using your scraper, scrape away the shaving cream in long swipes. Remove excess shaving cream with a paper towel. Allow to dry. This doesn’t take too long. 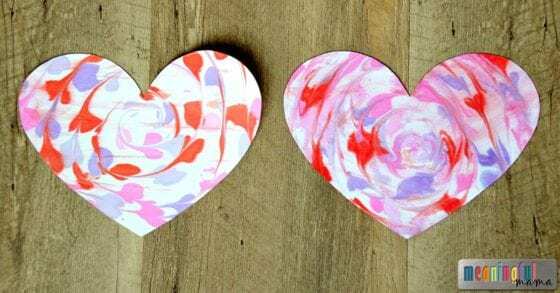 Kids can then write Valentine messages on the front or back. Did they have more fun making the craft or playing in the shaving cream afterward? I’m not sure. Oh well. They needed baths anyway. 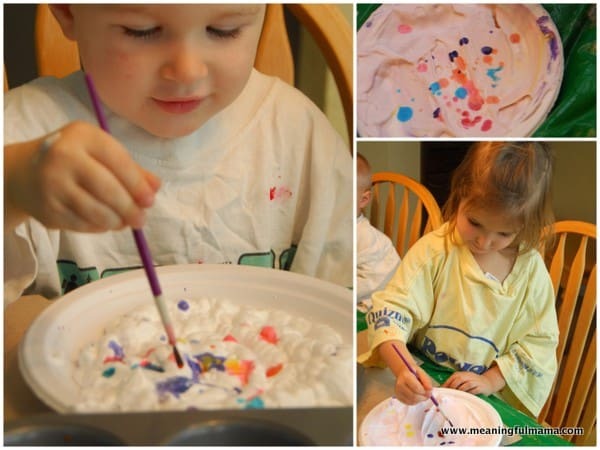 Here’s a couple tips: They use my old t-shirts for paint shirts. I use plastic, Dollar-store table clothes again and again to cover my table. I use the cardboard from cereal boxes to do crafts on. I know. I ended my sentence in a preposition. What is this? Grammar class? That reminds me of teaching nursery school! The oversized shirts to protect kids’ clothes, we got free “tablecloths” from the paper products manufacturer across the street. From the first pic, I never would have guessed this was a kid craft. It’s beautiful! What a fun idea! I’m a homeschooling Mama and totally trying this! Thanks girl! You’re welcome. I’d love to see the results and hear about your experience so check back in. Thanks for taking the time to comment.